Somewhere under all of this is grass. I’m sure of it. For my friends and family, I’m sure when I’m depressed it’s a laugh a minute. My New Month’s Resolution is to make my depression funny. And I don’t actually mean this month, which has 2 days left in it. I’m talking about April. Who likes feeling depressed? NO ONE. Of course, there are two sides to every coin, so without feeling low, being in a good mood would go by unnoticed. So to even write about this topic here has to be a little funny. Being nervous and being depressed are two totally different things. I’m not even sure that they overlap. But, as an example, when I’m nervous, like when I’m having surgery, I’m the life of the operating room. Even I know that sounds insane, but I guess it’s a defense mechanism. So how can we channel that (because I know I’m not unique in this) into real humor that lifts the sadness and gives us a boost of energy? All comments gladly accepted. Being in AA helps a lot. When I remember to take the advice to heart. The slogans are there for a reason and while sounding annoying at times, really work. Or they wouldn’t be around still. Let Go and Let God…no brainer…..when I remember. Then it’s an oh duh moment when I feel so much better and have truly shared the moment/event/feeling. This hasn’t ended up to be the funny post I intended it to be. It’s one thing to be depressed. It’s a totally other thing to write about depression and get MORE depressed (just in case you didn’t recognize it, that was a funny part because I do feel much better now). And my life is great, for the most part. So what’s up with that? If you live east of the Pacific Ocean, there is one big reason for depression. SNOW SNOW SNOW SNOW and more SNOW. Although we woke up to some snow again, today it will be 51 F where I live. 11 C for my non-Fahrenheit peeps. Oh look! There goes my depression off into the warm breeze. Ahhhhhhhh……..
p.s. 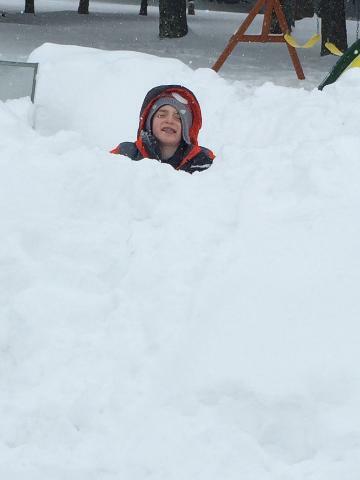 This young gentleman who bears a striking resemblance to my grandson was standing in a snowbank with no danger whatsoever. This entry was posted in Alcoholics Anonymous, depression, humor and tagged alcohol, alcoholics anonymous, depression, happiness, Humor, nervousness, resolutions. Bookmark the permalink. I’ve heard that depression is caused by being disconnected with our feelings and needs. Feelings, meaning emotions. And needs meaning, the universal needs that all humans have, such as the need to love, play, rest, be respected, and so forth. So you can channel your depression into a self-analysis by asking yourself how you feel, and what unmet needs are causing any undesirable feelings that you have.